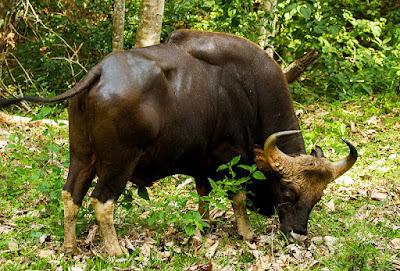 Male gaur Bos gaurus, copyright N. A. Naseer. The Bovini, cattle and buffalo, are a predominately Eurasian group of large grazing ungulates, with the only living (non-domesticated) species found elsewhere being the North American bison Bison bison and the cape buffalo Syncerus caffer of Africa. The most widely domesticated members of the group include the European cattle Bos taurus, zebu B. indicus and water buffalo Bubalus bubalis. 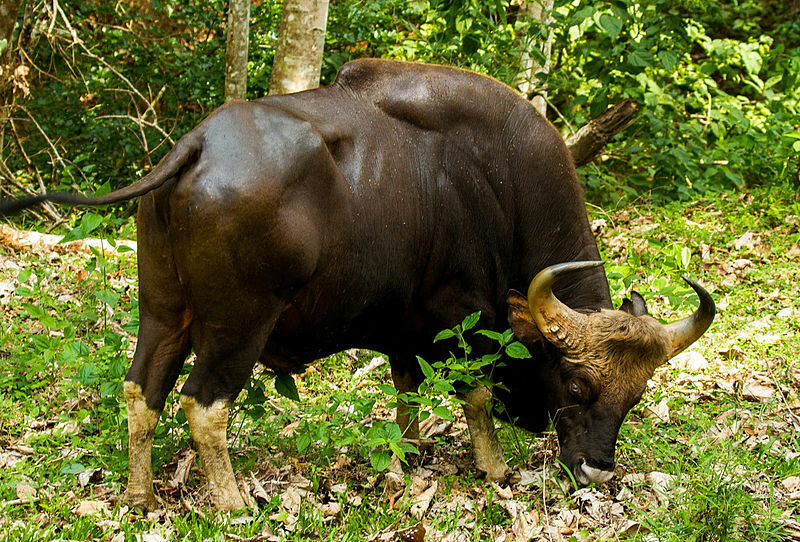 Other locally domesticated species are the gaur Bos gaurus, banteng B. javanicus and yak B. grunniens. Characters (from Gentry 1978): Skull low and wide; horn cores in both sexes emerging transversely from skull; frontals and horn cores with internal sinuses; braincase short, basioccipitals triangular; molars with basal pillars and complicated central cavities, upper molars with prominent outbowed ribs between styles, lower molars without large goat folds. [B61] Banfield, A. W. F. 1961. A revision of the reindeer and caribou, genus Rangifer. National Museum of Canada Bulletin 177: i–vi, 1–137. [B66] Blyth, E. 1866. A note on African buffalos. Proceedings of the Zoological Society of London 1866: 371–373. [B75] Bowles, J. B. 1975. Distribution and biogeography of mammals of Iowa. Special Publications, The Museum, Texas Tech University 9: 1–184. [BD01] Brandt, J. H., M. Dioli, A. Hassanin, R. A. Melville, L. E. Olson, A. Seveau & R. M. Timm. 2001. Debate on the authenticity of Pseudonovibos spiralis as a new species of wild bovid from Vietnam and Cambodia. Journal of Zoology 255: 437–444. [BP87] Burton, J. A., & B. Pearson. 1987. Collins Guide to the Rare Mammals of the World. Collins: London. [DW04] Deng T., Wang X., Ni X. & Liu L. 2004. Sequence of the Cenozoic mammalian faunas of the Linxia Basin in Gansu, China. Acta Geologica Sinica (English Edition) 78 (1): 8–14. [FS15] Faurby, S., & J.-C. Svenning. 2015. A species-level phylogeny of all extant and late Quaternary extinct mammals using a novel heuristic-hierarchical Bayesian approach. Molecular Phylogenetics and Evolution 84: 14–26. [FP64] Fisher, J., & R. T. Peterson. 1964. The World of Birds: A comprehensive guide to general ornithology. Macdonald: London. [G78] Gentry, A. W. 1978. Bovidae. In: Maglio, V. J., & H. B. S. Cooke (eds) Evolution of African Mammals pp. 540–572. Harvard University Press: Cambridge (Massachusetts). [GC-BG04] Gentry, A., J. Clutton-Brock & C. P. Groves. 2004. The naming of wild animal species and their domestic derivatives. Journal of Archaeological Science 31: 645–651. [G91] Groves, C. P. 1991. A Theory of Human and Primate Evolution revised ed. Clarendon Press: Oxford. [K99] Kennedy, K. A. R. 1999. Paleoanthropology of South Asia. Evolutionary Anthropology 8 (5): 165–185. [KK02] Kuznetsov, G. V., E. E. Kulikov, N. B. Petrov, N. V. Ivanova, A. A. Lomov, M. V. Kholodova & A. B. Poltaraus. 2002. Mitochondrial 12S rDNA sequence relationships suggest that the enigmatic bovid “linh duong” Pseudonovibos spiralis is closely related to buffalo. Molecular Phylogenetics and Evolution 23 (1): 91–94. [L50] Liu, C.-C. 1950. Amphibians of western China. Fieldiana: Zoology Memoirs 2: 1–400. [ME05] Moullé, P.-E., A. Echassoux, F. Lacombat, E. Desclaux & S. Bailon. 2005. L’environnement animal des premiers habitants de l’Europe méditerranéenne: les grands mammifères contemporains de l’homme du Vallonnet, données taxonomiques et biostratigraphiques pour la deuxième moitie du Pléistocène inférieur. BAR International Series 1364: 105–113. [TB01] Timm, R. M., & J. H. Brandt. 2001. Pseudonovibos spiralis (Artiodactyla: Bovidae): new information on this enigmatic south-east Asian ox. Journal of Zoology 253: 157–166. [UH84] Underwood, R., & S. J. G. Hall. 1984. Wild cattle and spiral-horned antelopes. In: Macdonald, D. (ed.) All the World’s Animals: Hoofed Mammals pp. 104–113. Torstar Books: New York. [VK06] Voigt, C. C., & D. H. Kelm. 2006. Host preference of the common vampire bat (Desmodus rotundus; Chiroptera) assessed by stable isotopes. Journal of Mammalogy 87 (1): 1–6. [VP93] Vu V. D., Pham M. G., Nguyen N. C., D. Tuoc, P. Arctander & J. MacKinnon. 1993. A new species of living bovid from Vietnam. Nature 363: 443–445. Last updated: 24 July 2018.